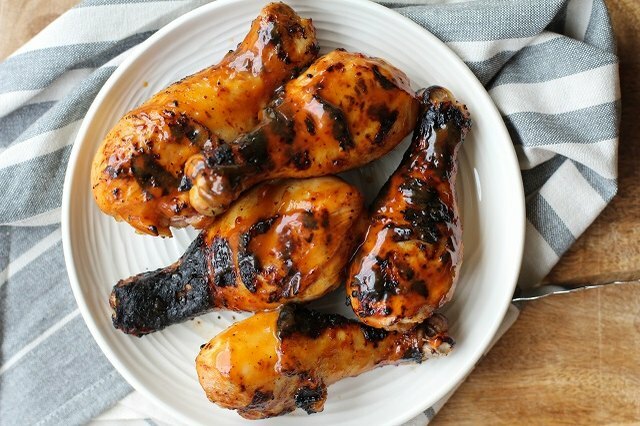 For tender, juicy chicken cooked on the grill, choose bone-in, skin-on drumsticks, thighs, or breasts rather than boneless skinless chicken. Drumsticks are perfect for serving at any gathering, large or small, because they make for easy cooking and easy eating. All you need is a store-bought or homemade marinade, dry rub, or barbecue sauce and you're slated for a delicious meal of fall-off-the-bone succulent chicken. Rather than marinating the chicken, you can sprinkle the chicken with salt, pepper, and any dry rub or spice blend of your preference. Consider using onion powder, garlic powder, chili powder, ground cumin, curry powder, Cajun seasoning, Jamaican Jerk seasoning, Garam Masala, and/or dried herbs such as oregano, basil, and rosemary. 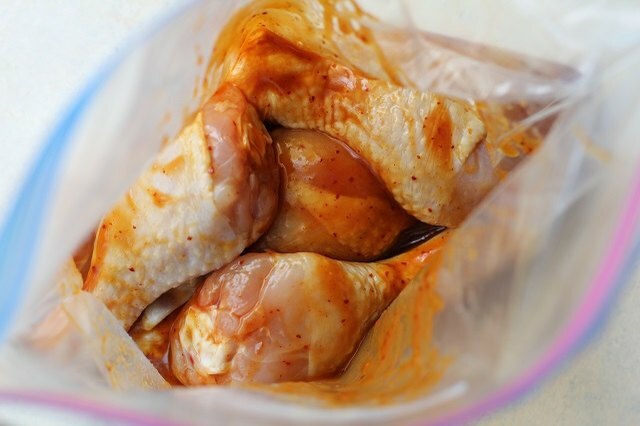 Add the chicken and simmer sauce to a large plastic bag. Seal the bag and maneuver the chicken so that everything is well-coated. Refrigerate for at least 15 minutes, up to 12 hours. If you'd like to use a dry rub, sprinkle the chicken with the rub 15 minutes prior to grilling. 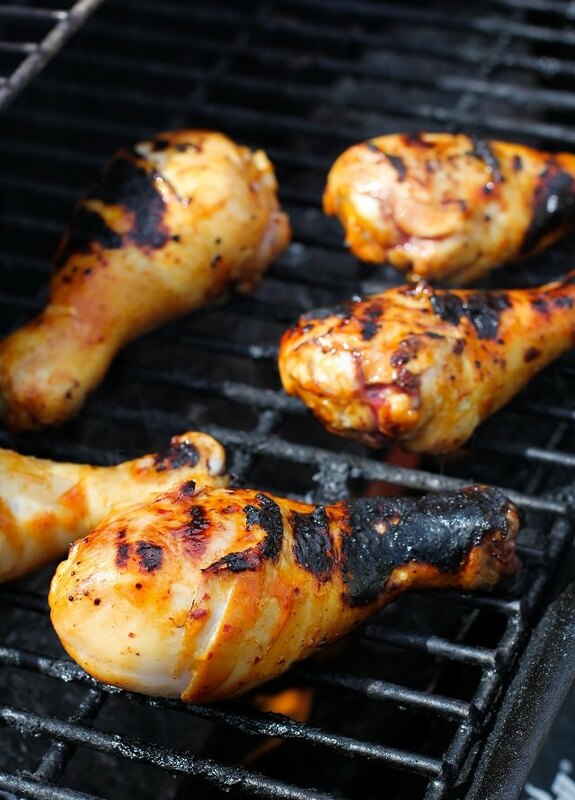 Allow chicken to come to room temperature prior to grilling in order to ensure the meat cooks evenly. Preheat the grill to medium-high heat (about 450 degrees F). If using a gas grill, turn the knob to 450 or the medium-high setting. If using a charcoal grill, heat coals until they turn white and have embers. Spread the coals over the bottom of the grill. Place marinated chicken onto the hot grill and discard the marinade. To avoid flare ups, place chicken pieces between the burners as opposed to directly over the flame. Cover the grill and cook for 2 to 3 minutes, until dark grill marks appear. Flip and cook on the other side for 2 to 3 minutes. 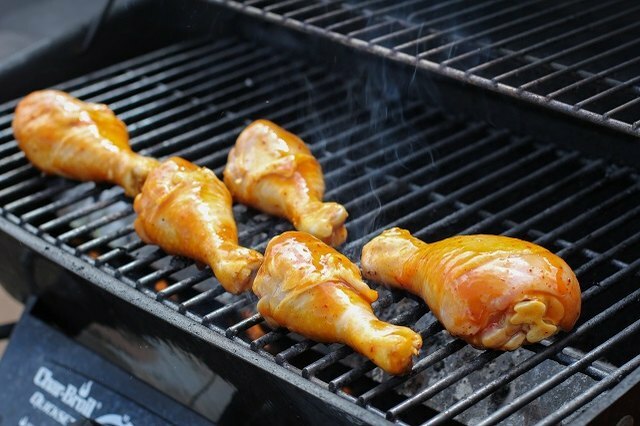 Continue flipping and cooking until the internal temperature of the chicken reaches 165 degrees F. If certain drumsticks are cooking faster than others, move them to the side or the back of the grill so that they continue cooking slowly over indirect heat. To test the temperature, insert a meat thermometer into the thickest part of the meat, avoiding the bone. Wait until the needle stops moving (if digital, wait until the numbers stop changing) to get an accurate read. To reduce the grill time, you can par boil the chicken. To do so, heat a large pot of water (or broth with spices) to boiling. Reduce the heat and carefully add the chicken. Simmer until chicken skin turns white and internal temperature reaches 150 to 160 degrees F. Transfer the chicken to a plate and spread barbecue sauce or marinade over each piece. Cook 2 to 3 minutes per side on the grill, or until internal temperature reaches 165 to 170 degrees F.